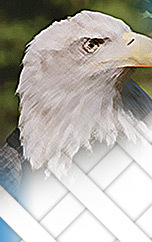 The intent of this installment, will be to explore the penalties of the above cited Sections of USC Title 18, sometimes known as the RICO ACT… after reading this Installment Readers can determine the probability that any action will be taken on the OIG US DOJ August 21, 2009 email referral to Criminal Division of US DOJ, first introduced in Installment #9. NOTE: If you are a new Reader of this series "NO WITNESS = NO CASE", you may want to begin with reading the nine prior installments before you read this one. The main objective of this Series of Installments is to lay out DEFENDANT’s rebuttal argument, and "Affirmative Defenses" to the State’s REPORT "Testimony" that was faxed to the Laconia District Court [LDC] in re: 09-cr-1293-4 minutes prior to the hearing on the merits of the May 15-16, 2009 arrests in re: 1293-94 (in both cases the DEFENDANT is charged with misdemeanor criminal trespass). In re: 1293-94 the misdemeanor was an "A" classification, which entitled her to a Public Defender attorney. In re: 4147 the charges were classified a "B" and therefore the DEFENDANT had to defend herself, pro se. The REPORT "Testimony" was also submitted to the court in re: 09-E-4147, whose charges and the subsequent arrests of the DEFENDANT occurred after the Belknap County Superior Court ORDER that GRANTED DEFENDANT’s MOTION for a Temporary Restraining Order against Waukewan Holdings, LLC. Section 1951 (relating to interference with commerce, robbery, or extortion), THE HOBBS ACT — 18　U.S.C. §　1951 "This chapter focuses on the Hobbs Act (18 U.S.C. §　1951) which prohibits actual or attempted robbery or extortion affecting interstate or foreign commerce. Section 1951 also proscribes conspiracy to commit robbery or extortion without reference to the conspiracy statute at 18 U.S.C. §　371. Although the Hobbs Act was enacted as a statute to combat racketeering in labor-management disputes, the statute is frequently used in connection with cases involving public corruption, commercial disputes, and corruption directed at members of labor unions." So, the first test of DEFENDANT’s argument is: Whether there have been any "principals" named by her that have also been named as associated with ongoing criminal organizations. Since, DEFENDANT’s argument is one of rebuttal to REPORT’s "expert testimony" to LDC, how did the State present this issue to the LDC in its October 13, 2009 REPORT? Incorporated into State’s REPORT in Sources of Information 6 is the January 9, 2009 "case study" letter that DEFENDANT wrote to OIGs of US DOJ and SEC. The letter was written by the DEFENDANT as a complaining victim of several federal criminal acts: to include the Hobbs Act cited above. The main issue of the ‘case study’ was DEFENDANT’s role as a ‘witness’ who had been subpoenaed by the Organized Crime Task Force that was prosecuting a case styled USA v Rennert. DEFENDANT’s testimony included naming Gene Phillips, and a person introduced to her as John Iuele, but whom she had later identified as James Whitey Bulger. [NOTE: For further information, click on hyperlinks identified by bold blue underlined text.] Both men have been publicly associated with ‘ongoing criminal organizations’. She also made allegations that she was aware of certain information that linked Robert Jaffe to the Blondheim Ponzi Scheme, and that Mr. Jaffe had also been linked to the Patriarcha Crime Family, (and to the more recent Madoff Ponzi Scheme that was the subject of Congressman Kanjorski’s Commission, which triggered the DEFENDANT’s January 9, 2009 "case study letter" that the State incorporated into its REPORT in Sources of Information 6 cited above (NOTE) text not in original letter). The Blondheim Ponzi scheme was uncovered in the early to mid-1980s. It is now public knowledge that the DEFENDANT caused the ‘whistle to be blown’. Incorporated into State’s REPORT Sources of Information 9 is the June 22, 2009 letter written by DEFENDANT, and addressed to Ms. Angela L. Beyers, Unit Chief, Initial Processing Unit, FBI, Washington, DC 20535-0001. In the body of the letter, DEFENDANT recounted her experiences with the legal process of the USA v Rennert trial (where all six defendants were found guilty on all charges). And she disclosed her knowledge of the association between former FBI agent John Connolly, and John Iuele (the individual who had extorted $6000 from her, in March 1989), and whom she later identified as James "Whitey" Bulger [NOTE: click MOST WANTED]. Mr. Iuele was either a client, or known associate of DEFENDANT’s attorney’s Devine Millimet Stahl & Branch [DMSB]. (If the readers will recall, former FBI agent Robert Fitzpatrick just published a book on related issues titled BETRAYAL). Also incorporated into the June 22, 2009 letter were the names of the Winter Hill Gang, and "Cadillac" Frank Salemme, and how they were implicated, as well. The State, by incorporating 6) and 9) into its Sources of Information section, has freely admitted to the LDC (and to the public as of October 13, 2009) that it was fully aware of DEFENDANT’s role in testifying for the Organized Crime Task Force in re: USA v Rennert, in March 1997. The State, by and through its Sources of Information section, also freely admitted to the both the LDC and to the public, that it was fully aware of the events that succeeded DEFENDANT’s March 1997 testimony. The State could have Googled the names highlighted in (blue) above, and found that they all have been associated with ongoing criminal organizations, at that time. "Within days of my completed subpoenaed testimony, I was informed that the High Birches pump house had been sabotaged. The water piping, valves and controls in High Birches pump house had been smashed. The heating system supplying the pump house water system had been shut off allowing the water pipes to freeze and burst. I filed complaints with the local authorities and with the Attorney General of the State of New Hampshire. I recall I even informed AUSA Faulkes. I believe it was at that time that she said she would try again to get the attention of the FBI with respect to our situation. [I am now aware that it was during this period that the FBI was in the midst of trials and other issues protecting its Top Echelon program, and Whitey Bulger and his Winter Hill Gang had already been named by me as an alleged perp in other related matters. It was around this time that I was informed that my records at the Boston FBI had ‘gone missing’. Apparently the Boston FBI did not want to raise any new complaints of mine at that time. I was never contacted by anyone from the Boston Office of the FBI, nor the USA prosecutor.]" "At this time the civil RICO case that I had brought in 1995, was in arbitration. On September 9, 1997 at a pre-arbitration meeting, the arbitrator signaled that he had read both arguments and was leaning in my direction. Three days later, on September 11, 1997, the main production well at the High Birches Springs located on westerly parcel of the No. Woodstock property, along with several adjacent monitoring wells had been found to be purposely contaminated with a cocktail of chemicals to include heavy metals and other carcinogens in criminal acts of sabotage, as defined by USC Hobbs Act and Title 18 RICO statutes." "A series of quick maneuvers by RICO defendants convinced US District Federal Judge Gertner to give possession of the entire No. Woodstock property to Crowninshield. The local authorities allowed Motions to be filed in the matter that stated I was the primary suspect. It should be noted here that the westerly parcel contained the production equipment that had been sabotaged, but it was the easterly parcel that contained the majority of the springs and at that time they remained untouched by any sabotage. I pointed this fact out to FDIC. Within days, the monitoring well on the easterly parcel was also sabotaged with a liquid contaminant which was later identified as a liquid equivalent in chemical make up to furniture stripper. Crowninshield had 24/7 Security guards on the site, at the time of the second contamination." "Within a day of the second contamination event, I was personally on the site, and saw a man in a red van that was later identified as belonging to the Winter Hill Gang. He was checking the monitoring well on the easterly parcel. It should be noted that only two people knew where that monitoring well was exactly located – myself and Reginald Danboise. When I attempted to read the license plate on the red van I was physically restrained from doing so by the local police. The red van quickly drove off after seeing the commotion." "In January, 1998 Judge Gertner had granted the RICO defendant’s Motion to Dismiss. One of the compelling reasons that she stated in her Order was that New Hampshire had expressed a desire ‘to police its own environmental problems’. To this day I do not know who from New Hampshire made the request that Judge Gertner acted upon. Jeanne Shaheen, wife of William Shaheen of Shaheen Gordon (my former lawyers who committed fraud upon me and the Hillsborough Superior Court) was Governor, at that time. Attorney John Broderick (former senior partner of Devine Millimet and then of Merrill & Broderick; both firms with clear conflicts of interest against me) was Chief Justice of the NH Supreme Court, at that time." Also of note is that I was informed by the Federal EPA investigator from the Boston Office, who had already begun his investigation into the commercial sabotage of High Birches Mountain Spring Water business immediately after I called him on September 12, 1997, that he had been "relieved of his duties" by his superiors. The clean-up was now under the control of civil RICO defendant Crowninshield, and the State of New Hampshire. Crowninshield paid the State of New Hampshire a reported $100,000 to decommission the main production well [over all my objections]. Let’s assume for the moment that DEFENDANT’s statements made in the January 9, 2009 letter to OIGs of US DOJ and SEC were true. 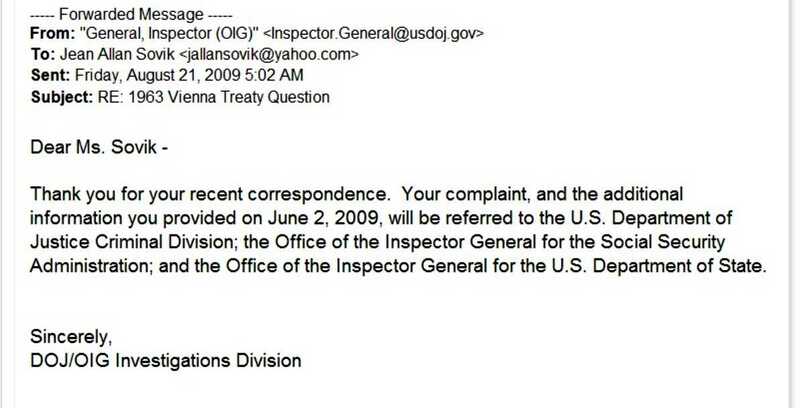 (Considering the OIG USDOJ’s August 21, 2009 referral email, there must have been some kernel of truth to it, or the referral would not have been made.) But, that is for the Readers to determine. The first question is: "Whether the State could have confirmed any of the DEFENDANT’s statements with second or third parties, or by public record?" The answer to this question is YES! Assuming that certain agents of the State had the incentive to do its own due diligence. Nevertheless, the DEFENDANT was prepared to introduce her ‘affirmative defense’ arguments, to include arguments of law and fact, at a full and fair trial on October 13, 2009, but she was denied that opportunity. The LDC accepted the State’s REPORT "expert testimony" at face value. No cross examination was allowed, in direct contradiction to the State’s own laws. So, another follow up question here would be: Whether the State’s agents, in October 13, 2009, had already been compromised with their prior actions of support with respect to the alleged "Retaliation" charges that had been reported by DEFENDANT, in her ‘case study’ letter to the OIGs of US DOJ and SEC? Here are some of the State’s "expert testimony" with respect to DEFENDANT’s reports of "Retaliation". The Readers’ may get some indication of the State’s predisposition after reading the bulleted statements incorporated into State’s REPORT. "Her descriptions at times almost sounded like a novel, and she has the self-importance in the "story" that is suggestive of a film documentary." 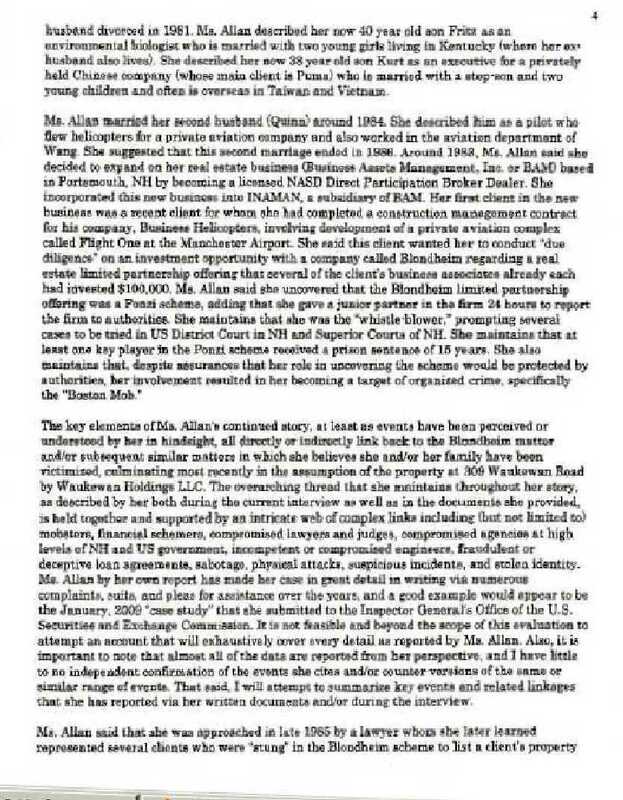 "Grandiose features of a delusional disorder also are apparent via the inclusion in her "story" of famous or publicly important figures like Whitey Bulger, F. Lee Baily, Warren Buffett, and the Supreme Court Justice and the Governor of NH." "The content of Ms. Allan’s thinking, a circumscribed within her living and evolving "case study" or "story" does appear to be psychotic, characterized by a web of non-bizarre delusional perceptions and beliefs that is self-justified and self-fueled by its own internal logic." 2) Beginning on page 2 Sources of Information 6, Defendant explained to the OIGs of the USDOJ and SEC how she became to be involved, and ultimately caused the ‘whistle to be blown’ on the Ponzi Scheme, known as Blondheim. "In 1983, after being a real estate broker, I decided to widen my business opportunities by becoming a licensed NASD Direct Participation Broker Dealer. I incorporated a separate NASD DPP Broker Dealer company named INAMAN. It was a wholly owned subsidiary of my primary real estate company, Business Assets Management, Inc., located on High Street, Portsmouth, New Hampshire. By late 1983, INAMAN was opened for business." "INAMAN’S first client was a former business associate and client of mine. I had just completed a construction management contract for his company, Business Helicopters. The job entailed the design, permitting and construction of a private corporate aviation complex, named Flight One, at the Manchester Airport, Londonderry, New Hampshire." "My client’s request was that I perform due diligence on a real estate limited partnership offering by a company called Blondheim. Mr. David Williams was the principal general partner and Raymond Nolan was a minority partner in the general partnership. My client told me that several of his business associates had purchased limited partnerships for one hundred thousand dollars each. He was considering doing the same." "Shortly after I began my due diligence analysis, I recognized the offering to be a Ponzi scheme. [A complete description of the scheme and the schemers can be found in USA v David Williams/Blondheim. Several cases were tried in both US District Court in New Hampshire and New Hampshire Superior Courts. Mr. Williams was convicted and sentenced for 15 years. Many of my client’s business associates suffered financial losses. The authorities assured me that my role as a ‘whistle-blower’ in uncovering the Blondheim Ponzi scheme would be protected. For whatever reasons, it was not, and I became a target of the organized criminals that had been backing the scheme. This case study is a cautionary tale for all ‘whistle-blowers’.]" "One of the reasons that I could easily spot the Blondheim Ponzi scheme was that the properties involved were local and I could personally view the real estate assets. Subsequent to my discovering the Blondheim Ponzi scheme, I began a more careful due diligence on all the other Prospectuses that my office received and notice too many similarities to make me comfortable in many recommendations, if any. One of the bothersome issues was the way the Partnerships were being financed. So I continued to concentrate on my primary real estate consulting and sale’s business." "It is not feasible and beyond the scope of this evaluation to attempt an account that will exhaustively cover every detail as reported by Ms. Allan. Also, it is important to note that almost all of the data are reported from her perspective, and I have little or no independent confirmation of the events she cites and/or counter versions of the same or similar range of events." Serial Readers will recall the "I smell a rat test". The State’s above REPORT "expert testimony" to the LDC on October 13, 2009, with excuse for not doing its own due diligence; clearly does not pass. But why would the State’ agents go to such lengths to prevent DEFENDANT from presenting her ‘affirmative defenses’, and perhaps risk becoming enmeshed in a USC Title 18 Sections 1513 1512 1951 violations investigation? Only those "certain" State agents can testify to their own acts and motivational incentives. Perhaps some day they will get that opportunity, under oath. 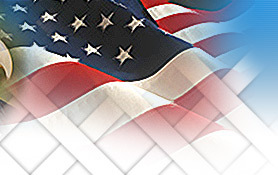 What was the incentive for certain agents of the State of New Hampshire to contact a sitting US District Court Judge with the request that New Hampshire take jurisdiction over the September 11, 1997 sabotage of the main production bore hole and surrounding monitoring wells located at the High Birches Springs property in North Woodstock, NH? And, then not supervise the investigation that they claimed was in the public interest of the State to pursue? What was the incentive for certain agents of the State of New Hampshire to publicly declare that DEFENDANT was the prime suspect of the 9/11 Sabotage of the High Birches Springs water source? What was the incentive for certain agents of the State of New Hampshire Office of Attorney General to terminate any investigation, if any, of the 9/11 Sabotage of the High Birches Springs water source, once it gained jurisdiction? What was the incentive for certain agents of the State of New Hampshire to influence the Boston Office of the USEPA to terminate the ongoing investigation of US EPA investigator Duane Sims of the 9/11 Sabotage of the High Birches Springs water source? What was the incentive for certain agents of the State of New Hampshire Office of Attorney General and Department of Environmental Services to allow Martha HW Crowninshield to control the clean-up efforts, which were caused by the 9/11 Sabotage of the High Birches Springs water source? What was the incentive for certain agents of the State of New Hampshire to accept a $100,000 payment from Martha HW Crowninshield? What was the incentive for certain agents of the New Hampshire Banking Department to make the findings that they did with respect to DEFENDANT’s, among others, complaints in re: SN Servicing Corporation, Inc. et al and Laconia Savings Bank? What were the incentives for certain members of the Judicial Conduct Committee, and the Professional Ethics Committees to make the determinations that they did with respect to DEFENDANT’s filed "grievances"? What was the incentive for certain agents of the State of New Hampshire Department of Corrections Office of Forensic Examiners to authorize, fax, and introduce into evidence the October 13, 2009 REPORT, in re: the above cited criminal cases? What was the incentive for the Commissioners of the respective New Hampshire Boards of Medicine and Mental Health to take no affirmative action with respect to DEFENDANT’s filed "grievances"? What was the incentive for certain agents of New Hampshire’s law enforcement to arrest DEFENDANT? What was the incentive for New Hampshire State Prosecutor Robert Libby to pursue the above cited charges against the DEFENDANT? What was the incentive for certain New Hampshire judges to make the decisions that they Ordered with respect to DEFENDANT’s civil and criminal matters? What was the incentive for certain State of New Hampshire correction officers to book DEFENDANT using her Panamanian birth name of Jean Elizabeth Allan Sovik, and then deny her access to a lawyer in violation of the 1963 Vienna Treaty? And, then mistreat her while in custody for two days waiting for her arraignment? "She therefore is essentially looking to use the proceedings as a forum to put to trial her entire delusional thesis. A trial for her will involve attempting to get even more data to understand the alleged conspiracy better, with more investigation and unearthing of detail to prove the conspiratorial links still left uncompleted and/or which she had yet to convince a Court about thus far". One could interpret the State’s above "expert testimony" to be that, if the true motivations, or incentives of certain agents of the State of New Hampshire’s were to be discovered, then those certain agents may have to pay the penalties as laid out above in USC Title 18: sections 1512 1513 and 1951 The Hobbs Act. So, let’s make certain that the lid stays on "Pandora's Box", and ORDER DEFENDANT "Not Competent". Installment #11will be dedicated solely to "A Daughter's Promise".